Here, a 27-year-old family medicine resident shares how she affords (and makes time for) her wellness habits while working up to 80 hours a week. Rent: $1,200 per month, including utilities. Other big expenditures: $438 to $488 per month. My monthly car payment is $200 a month, and I spend between $150 and $200 on gas a month. My only other monthly bills are my cell phone, which is $40 a month and internet, which is $48 a month. I don’t have cable, and I use my sister’s Hulu account, which she pays for. Food: $300 per month. I don’t follow any particular eating plan, but I do try to eat healthy. I buy organic when I can, but don’t get too hung up on it, because that can get pricey. I go food shopping once every two weeks and pay $100 a month to belong to a local food co-op, which helps me save a few cents on various items. I like to buy things in bulk there, like nuts, rice, beans, and occasionally Larabars. I shop a lot at Trader Joe’s, which is where I get all my basics like bread, almond butter, peanut butter, eggs, yogurt, frozen broccoli and oatmeal. If the produce looks like it’s of good quality, I like to buy clementines, oranges, apples, bell peppers, cucumbers, grape tomatoes, and carrots. Sometimes I go to Whole Foods if the produce at Trader Joe’s looks like it’s been picked over too much. My boyfriend and I eat out about two times during the week and once on the weekend, but we try to go places that are healthy and not very expensive, like Honeygrow, which has really delicious and healthy bowls, stir-fries, and salads. It’s typically about $10 for something. I bring my breakfast and lunch to work each day, and if I’m working during dinnertime, the hospital covers my evening meal, so that’s a good perk. Fitness: $140 per month. I share a family-plan membership to a local gym with four friends, and we each pay $40 a month. 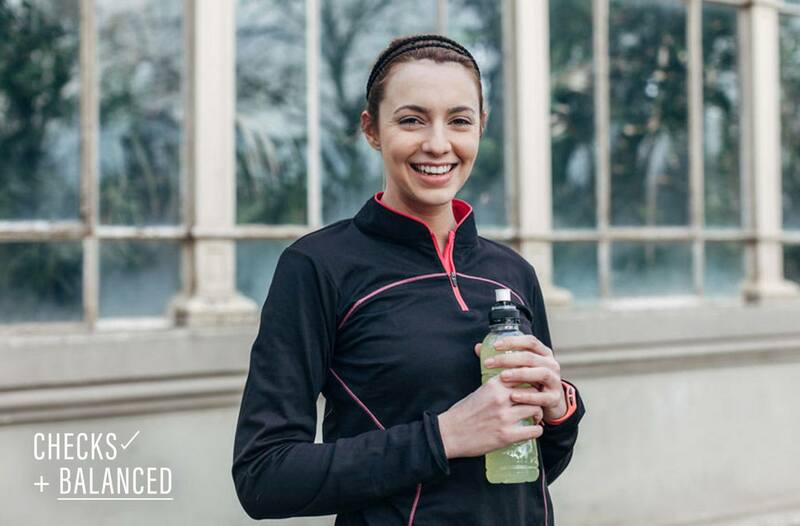 I’m a runner, and I like to run outside, but often it’s too dark when I’m home from work. I get my fix by hopping on the treadmill at the gym a few times a week, and I also belong to Orangetheory, paying $100 for eight classes a month. 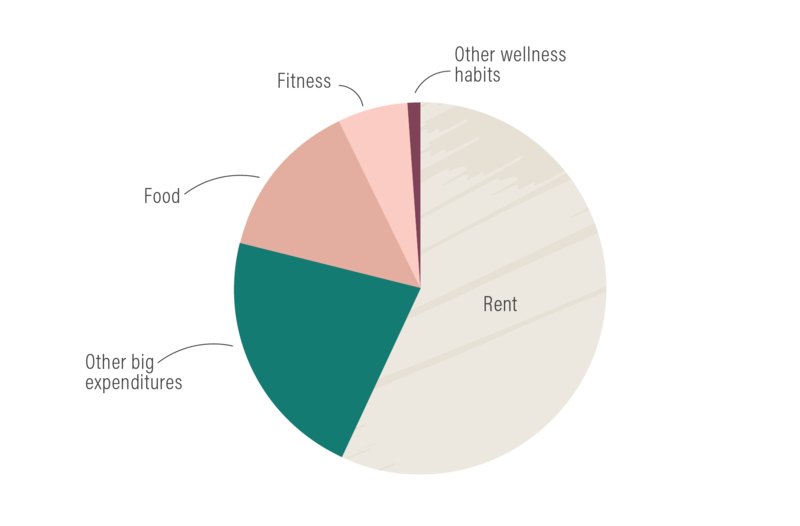 Other wellness habits: $0 on average per month. Besides healthy food and fitness, I don’t really spend much on other wellness habits. I’m not very big into things like clean beauty and essential oils, and when it comes to workout clothes, I really just buy a pair of leggings about once every six months. Biggest wellness splurge: Eating a healthy diet is very important to me, which is why a decent portion of my budget goes to food. When I eat better, I feel better and have more energy to dedicate to both work and my personal life. All of these things make me happier and allow me to have a more balanced life. Similarly, exercising is important to me and my work-life balance, which is why I budget for my fitness habits. In fact, if I go too long without exercise—more than a week—my stress levels are definitely higher, and I am definitely more irritable. The bottom line: Working 60 to 80 hours a week really does make prioritizing wellness difficult, but maintaining healthy habits makes me feel balanced and calm. Healthy food and regular fitness are where I really prioritize my wellness. Want to be featured in Checks+Balanced? Email emily@wellandgood.com. Is healthy food affordable on a food-stamp budget? Here’s what one editor found out when she put herself to the test. Plus, how one online grocery store is helping people save by selling everything for $3 or less.